Oxford Film Festival Take 5 With...: Take 5 with "Made in China"
Take 5 with "Made in China"
The Oxford Film Festival begins today! We are gearing up for a great opening night and to end our time getting to know filmmakers before they arrive, we present you with our last Take 5 with. Thanks for taking this journey with us and we will see you tonight at the movies! Judi Krant answers our final questions about her delightful narrative feature, "Made in China." Her film screens Friday at 7:20 p.m. and Saturday at 10:20 a.m.
JK: It's an unexpected, inspiring, adventure-driven, informative, chocolate-covered, joyride. JK: Biggest lesson: Leap and the net will follow. 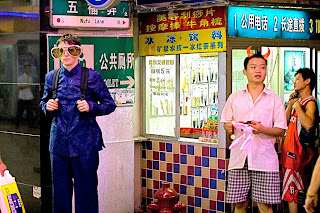 Best part: Showing audiences a side of Shanghai they haven't experienced is great fun. I like hearing people say that they feel they've gone on an adventure with the central character. And since it's a story about novelty inventors, folks always come up to me after the film and tell me about their own hilarious ideas for inventions. I love it. Everyone has a big idea in there somewhere! JK: I've been a lover of storytelling since I was a little kid, but "Made in China" is my first feature, so I've been elated and humbled by how it has been received. Before this, I was focused on writing screenplays and selling cars that ran on recycled vegetable oil. I was once in a turf war with a mobster over the used oil from a fried food stand. He bullied me into a high-speed car chase that exhausted my veggie-mobile and that scared me right out of the fringe fuel business. After that, filmmaking got my undivided attention. JK: To get the film seen by as many people as possible and pay back the fine folks who bravely invested in a first time female director making an indie comedy, guerilla-style, in mainland China. I think that's a good sign, don't you?